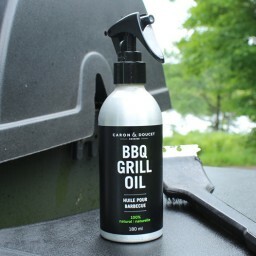 Created as an alternative to harsh and often corrosive products typically used to clean BBQ. Made with 100% natural plant based materials making it a safe option around food. Formulated using a blend of pure citrus essential oils reputed as an effective natural degreasing and deodorizing agent. This lightweight refined coconut oil base composed of 100% natural ingredients provides exceptional protection from moisture and oxidation damage, rinsing not required. Not to be used on open flames, use once you are finished BBQing to leave the grill ready for the next time. 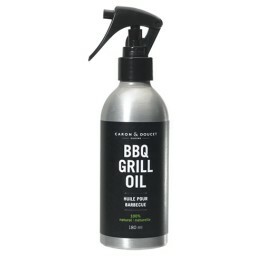 This product is designed to remove cooked on grease residue and food odours from BBQ grill surfaces. It creates a clean and non-stick surface that leads to enhanced food flavour while preventing excess smoke. Ideal for all cast iron, stainless steel, and enamel grilling surfaces of both gas and charcoal BBQ. Apply after cooking while BBQ is still warm ensuring all flames and coals have been extinguished. Remove large loose food particles with an abrasive brush. Spray on BBQ oil and rub with a cloth or paper towel. 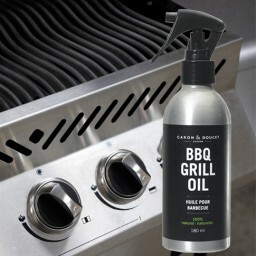 Use an adequate amount of oil to remove all food residue while leaving a thin protective coating that will protect grills from moisture damage. Here are some tips on how to clean your grill. 1) Cleaning your BBQ while still warm allows cooked on food particles to be removed easily. This method will prevent debris and grease from hardening on the surface of the grill. 2) Cleaning your grill after use saves cooking fuel as it will not require a lengthy preheating. 3) Be sure to leave a thin coating of bbq oil in order to condition grill and prevent rust.